OKC dental implants provide lifelike, secure tooth replacement that preserves surrounding teeth and underlying bone structure. Surgically placed and customized with porcelain crowns, OKC dental implants from Joe Isaacson Dental give patients a solid foundation that lasts for years. When people lose teeth to decay, gum disease or accident, oral health is compromised. Neighboring teeth shift, and the jaw bones begins receding almost immediately around the empty tooth socket. Is there a good solution to tooth loss? The answer lies in OKC dental implants from cosmetic and family dentist, Joe Isaacson DDS. Skilled in the art and science of placing dental implants for a lasting, natural-looking tooth replacement choice, Dr. Isaacson asserts that dental implants keep surrounding teeth in place, help bone remain sizable and dense and also look exactly like natural teeth in form and color. Dr. Isaacson also uses dental implants singly or in multiples and also installs them to support bridgework or fixed or removable full dentures. These restorative devices are versatile, long-lasting and exceptionally durable–so much so that patients cannot tell their implants from their healthy natural teeth. Additionally, the titanium in the implant device helps bone remain strong and actually bonds with the natural bone structure in an amazing process called osseointegration. This process is nature’s own way of accepting and integrating the dental implant. What is involved in an Oklahoma dental implant procedure? Dr. Isaacson carefully assesses the appropriateness of implants for each patient. Healthy gums, sufficient bone and good oral and systemic health are essential. However, in the absence of adequate bone, Dr. Isaacson has procedures in place to build-up the jaw with donor tissue or other materials as needed. During an in-office procedure, Dr. Isaacson puts the implant into the jaw and allows the site to heal for several weeks. This treatment usually requires nothing more than local anesthesia for the patient to be completely comfortable. 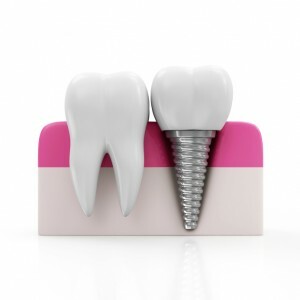 During the next visit, he attaches the post and crown to the implant, adjust the restoration for bite and fit. At this juncture, the procedure is complete. With careful brushing and flossing, along with routine cleanings and check-ups at the office, the implant will function and look great for decades. Implants have a success rate of up to 98 percent! Dr. Isaacson has placed numerous dental implants in his Oklahoma City office. He and his team will take good care to offer the right solution for your missing teeth. Why not find out more about this state of the art dental service by contacting Joe Isaacson DDS today for a personal consultation?